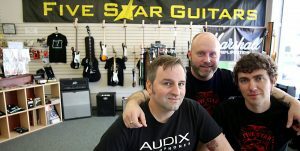 Jeremie Murfin had been teaching lessons at Five Star Guitars in Beaverton for years when he and two other employees decided to buy the shop in 2012. Jeremie and his co-owners went to the SBDC for guidance. “In some cases, it was reassurance that we were doing some things correctly or well that we were unsure about,” he said. The SBDC helped Jeremie rewrite the business plan for Five Star Guitars and connected the new owners with local banks. They were able to acquire a tenant improvement loan to build lesson studios, an office, warehouse and showroom floor in their new location. “We’ve won industry and Small Business Administration awards, thanks in no small part to SBDC,” Jeremie said. Five Star Guitars sells new and used instruments, amps and equipment. The shops also offers lessons and instrument repair services. SBDC helped Jeremie and his co-owners better understand employee/employer relationships. SBDC also recommended he find a lawyer who could help them negotiate their lease, which they did.